Infor VISUAL Support Tips & News: Did you know that patches are still available for older releases of VISUAL? Did you know that patches are still available for older releases of VISUAL? Since the latest VISUAL release 7.1 is out, you may feel that your older release is not important to Infor. This is NOT TRUE! While no software company can actively create enhancements and fixes on all previous releases, it may be worth checking into the InforXtreme site to see what is available. Even if your release is no longer being actively patched, nearly all of the previously created updates and fixes are still available. You may have missed some that you want! Below is a quick guide to the end of patch dates for some older releases. If you haven’t been on Infor’s support website for a long while, you may be surprised to learn that it has changed. When you go to the old Infor365.com, you will now be asked to go to the current InforXtreme support site. Once you arrive at the InforXtreme site, you will see many ways to search for your patches. Don’t forget that the actual word “patch” along with your version number is a pretty good search phrase. It is very important that you thoroughly read all documentation that accompanies any patches that you intend to install. Also, YOU MUST PROPERLY BACKUP your systems in case you don’t like the results of your activities. Caution: The following is only to retrieve very old files. You should always search the main site for more current versions of these files before venturing here. 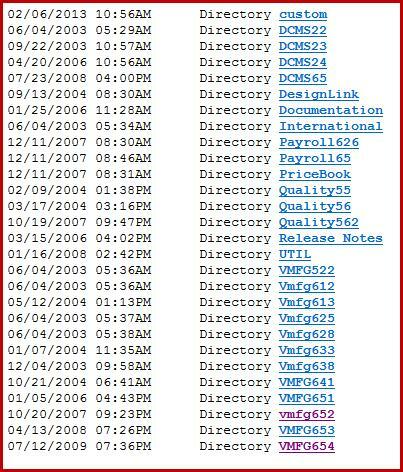 As you can see from the dates on the directories, Infor has made an effort to keep this archive of old patches available long after most users would need them. Please remember if you ever feel uncomfortable about applying patches, the consultants at BizTech are always here to help you.